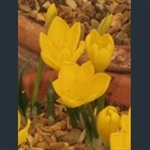 The Sternbergias are autumn-flowering bulbs with crocus-like flowers, in most cases golden yellow. Unlike crocuses, which are in the iris family (Iridaceae) and the so-called autumn crocuses (Colchicum), which are in the lily family (Liliaceae or Colchicaceae), these are related to daffodils, in the Amaryllidaceae. They like sunny, well-drained sites. A succession of rapidly-forming yellow crocus-like flowers in September.